Below are the prices of most of the items from the 2013 Auction that were covered by this blog. The links go back to the original entries, providing further details for reference. The downloadable version of the 2013 Auction Catalogue has now been moved to the new Archive section. We are leaving it available for reference. We would like to take this opportunity to thank all the bidders, buyers and, of course, the vendors for helping to make this year's event a success. We begin taking in items for our 2014 Auction from around October/November. Please feel free to contact us for advice on valuations or placing items for auction with us. 2013 Beatles Auction - a very quick round up. Everyone here at the Beatles Shop had a feeling that our auction this year was going to be a bit special, and we weren't wrong. There were some brilliant lots and we are really pleased with the prices some of the items fetched for the vendors. Lots of people have been asking about the door to 20 Forthlin Road, sadly this item failed to reach its reserve price and remained unsold. However, our other star lot, John Lennon's tie, did sell. The hammer price was £3120. The sale even made Rolling Stone web site! Click here to read the article. The lot that took us by surprise was one of the Quarry Bank School text books signed out by John Lennon, one of these contained two early Lennon signatures and sold for an amazing £7400. The vendor was in the room and couldn't believe the price. The other, with one signature in, went for £2800. Obviously there's a lot of interest in early signatures and things to do with life pre-Beatles. The Junior Mastro guitar still in its packaging sold for £2400. Most of the value there is in the packaging, it's unusual to find toys still with their boxes these days. The set of autographs obtained at the filming of Magical Mystery Tour sold for £4300. The sets of five autographs featuring both Pete Best and Ringo Starr sold for £4600 and £5500. These are just the highlights. Once we've fully recovered from Beatle Week there will be a list of prices for the lots we covered in the blog this year. Unfortunately due to technical problems we are now unable to offer telephone bidding at this year's auction. PLEASE NOTE LOT 194 HAS BEEN WITHDRAWN. Below is a list of everything we have covered in the blog this year along with the lot numbers of each items. All the entries have colour photographs of the items and usually a bit more detail about each item. We have the door from 20 Forthlin Road up for sale in our auction this year. The door was on the former McCartney homestead when the family moved out and the property was sold. Some years later work was done on the house and the door was rescued (with permission) from being thrown away. More recently the door was sold on in auction to the current vendor. 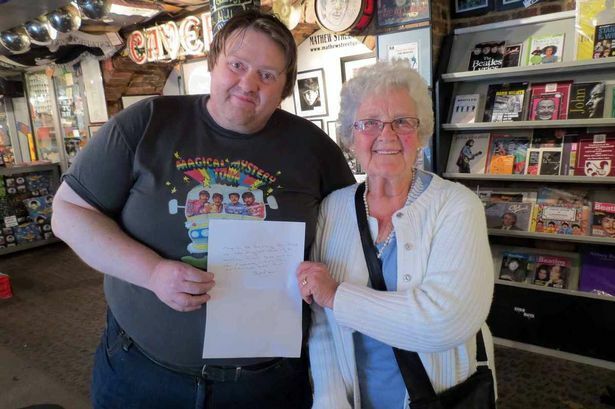 The door comes with a letter of provenance from Mrs Sheila Jones who moved into the house after the McCartneys left. You can read about how the letter was obtained on the Liverpool Echo site. This is an amazing piece of memorabilia and would certainly be the "conversation piece" in any Beatles collection! IMPORTANT NOTICE - VAT IS PAYABLE AT 20% ON THE FULL AMOUNT OF THE WINNING BID FOR THIS ITEM. How do I get into the auction? Entrance to the auction is by catalogue. This is your ticket in. Catalogues are free and can be picked up from The Beatles Shop once they are available. Also there is usually someone in the Adephi Hotel foyer handing them out on the Friday before the sale and the Saturday morning before we begin. A downloadable version of the catalogue will also be available on this site. If you are attending the auction and may be looking to bid on any item(s) you must register at the desk before the sale begins. You will need to provide us with contact details and we will give you a bidding paddle with a number on it. You need to be sure the auctioneer has written this number down if you are a successful bidder. How do I make an absentee bid? You can use the bidding form on this site, but please contact us if you do not receive an acknowledgement via email that we have received your bid. You can also fax your bid to us on 0113 2779750, or from the USA 0144113 2779750. Or you can email bids to auction@thebeatleshop.co.uk, again please get in touch if an emailed bid is not acknowledged. Do you accept Overseas Bids? We certainly do. See above for the contact details for absentee bidders. All bids must be made in Pounds Sterling, not local currency. Overseas bidders will be asked for credit card details to secure their bids, however this does not have to be the method of payment if your bid is successful. Should you be the winning bidder you will be contacted so that payment can be arranged. If instructed we will execute bids and advise intending purchasers. This service is free. Lots will always be bought as cheaply as is allowed by such other bids and reserves that are on our books. In the event of identical bids the earliest will take precedence. Always indicate a "top limit" - the amount to which you would bid if you attended the auction yourself. "Buy" or unlimited bids will not be accepted. Orders, when placed by telephone are accepted but only at the sender’s risk, and must be confirmed before the sale by letter or fax. Fax number for bids only: 0113 2779750, or from the USA 0144113 2779750. Or you can email bids to auction@thebeatleshop.co.uk (please note if you email is not acknowledged after two or three days please resend. To assist the progress of the sale, all intending buyers are asked to collect a bidding paddle before the commencement of selling. All intended purchasers who are not known to the auctioneers should bring with them some means of identification. The numbered paddle may be used to indicate your bids to the auctioneer during the sale. Should you be the successful buyer of any lot, please ensure that your bid paddle can be seen the auctioneer, and that your number is called out. Should there be any doubts as to price or buyer, please draw the auctioneer’s attention to it immediately. All lots sold will be invoiced to the name and address given against the issue of the numbered bid paddle and cannot be transferred to other names and addresses. Please do not mislay your paddle. In the event of loss inform the sales clerk. At the end of the sale please return your paddle to the registration desk. This system does not apply to order bidders. A buyer’s premium of 17% of the hammer price is payable by the buyer’s of all lots, this includes VAT. The pre-sale estimates are intended as a guide for the prospective purchaser. Any bid between the listed figures would, in our opinion, offer a fair chance of success. However all lots, depending on the degree of competition, can realise prices above and below the listed estimates. It is always advisable to consult us nearer the time of sales as estimates can be subject to revision. Items not collected within five working days (Saturdays included) of the sale will be liable to storage charges. Payment would be preferred by cash or banker’s draft. Buyers are advised that property will not be released until funds have cleared. We are able to accept payment via Mastercard, Visa and Amex subject to the discretion of the auctioneers and authorisation. The service charge of 3% made by these credit companies will be passed on to the user. Payment via debit card occur no extra charge. Purchases may be collected or dispatched upon full payment for the goods. Should shipping be required by the purchaser, costs will be incurred at their expense. All cheques and banker's drafts will be accepted subject to clearance..
To be arranged with the auctioneers. All carriage charges to be paid prior to shipping. Purchasers are requested to arrange clearance of lots as early as possible and are reminded that purchases are only insured for five days. Buyers are reminded that all lots are sold as shown, and it is their responsibility to inspect the lot for sale. The absence of reference to condition in the catalogue does not imply that the lot is free from faults or imperfections, unless the lot carries a condition description. Also, unless stated in the description items do not come with letters of authenticity or provenance, nor can such documents be obtained from vendors after the sale. Please note that the auctioneers are not able to provide documentation regarding items sold, unless it has been provided by the vendor when the item was placed into the auction. BUYERS ARE REMINDED THAT THERE IS A BUYER’S PREMIUM PAYABLE ON THE FINAL BID PRICE OF EACH LOT. The estimated prices printed below the catalogue descriptions are approximate . They are not definite. They are prepared well in advance of the sale and are subject to revision. Lot 194 - The US issued White Album number 4 - has been withdrawn from this year's auction. This is due to circumstances beyond our control and we apologise for any inconvenience this may cause. We will be contacting those who have placed absentee bids with us in due course. Due to us getting a few enquiries about placing items into the auction we would like to remind people that the auction is full. We have limited space each year, and usually stop taking items in June at the latest. (This year it was earlier due to the high volume of items we'd already received) This is to give us time to lot up the items and to produce the auction catalogue. You can not turn up with items on the day of the auction and expect them to be entered into the auction. However, if you have something you would like to enter into next year's auction or simply would like valued then please contact us for valuations and advice. We need a little breather after the auction and Beatles Week to catch up with ourselves and get all the paperwork involved with the sales sorted out, but we start to take items from around October/November. See the FAQ page for any questions you may have about selling your items with us.